Apparently, the answer is electric resistance water heaters since they are now being depicted (unwittingly or otherwise) as “batteries” for thermally storing “clean” electric energy. But toasters may not be far behind. The following article is about the latest rash of “crony environmentalism” under the guise of “deep decarbonization” through increased electrification of everything possible; regardless of adverse economic impacts. For better or worse, Congress has delegated broad authority to the Department of Energy (DOE) to mandate minimum energy efficiency standards for most major (and many minor) residential and commercial energy consuming products. Such authority is primarily based on the Energy Policy and Conservation Act of 1975 (EPCA). Essentially, EPCA is being continuously modified through legislative amendments; the vast majority of which confer increasing authority to DOE. Common water heaters are no exception. DOE first established energy conservation standards for residential water heaters in 1990. These have been periodically updated. These start with a “Notice of Proposed Rulemaking” (NOPR). Before being amended by the National Appliance Energy Conservation Act of 1987 (NAECA; Pub. L. 100-12), Title III of EPCA included water heaters equipment as covered products. NAECA’s amendments to EPCA established energy conservation standards for residential water heaters, and required that DOE determine whether these standards should be amended. (42 U.S.C. 6295(e)(1); 42 U.S.C. 6295(e)(4)) DOE initially amended the statutorily-prescribed standards for water heaters in 2001 (66 FR 4474 (Jan. 17, 2001)) and amended standards for water heaters for a second time in 2010 (75 FR 20112 (April 16, 2010)) (April 2010 Final Rule). The energy conservation standards for residential water heaters in the April 2010 Final Rule will apply to products manufactured on or after April 16, 2015. 75 FR 20112. This final rule completed the second amended standards rulemaking for water heaters required under 42 U.S.C. 6295(e)(4)(B). The standards consist of minimum energy factors (EF) that vary based on the storage volume of the water heater, the type of energy it uses (i.e., gas, oil, or electricity), and whether it is a storage, instantaneous, or tabletop model. 10 CFR 430.32(d). The currently applicable water heater energy conservation standards, as well as those that will be applicable starting April 16, 2015, are set forth in Table I.1 below. To give some benefit of the doubt to the Brattle Group, they never exactly said that electric resistant water heaters should be considered “grid enabled” storage devices for renewable energy. The title of their study just implies that. The study only states the objective is to illustrate “a plausible case in which the marginal fuel is a mix of natural gas and renewables” (emphasis added). And that seems to be enough to make it so for most “clean energy” advocates. For instance, in California, where there is no coal generation and nuclear units are inframarginal, natural gas and hydro compose the vast majority of marginal generating units, with some economic and manual curtailments of wind and solar as well. Hydro-electric dams are, in fact, already storage systems as evidenced by the massive water reservoirs upstream of them. I learned that the hard way kayaking on the South Fork of California’s American River in the early ‘70’s. How much exactly is “some “wind and solar,” especially on a time-of-day basis? California represents an escalation of “deep decarbonization” policies that started about 10 years ago. In late April of 2015, Gov. Brown issued an executive order to cut greenhouse gas emissions to 40% below 1990 levels by 2030; an order designed to jumpstart compliance with a 2006 environmental law signed by former governor Arnold Schwarzenegger requiring an 80% cut by 2050 compared with 1990. In September of 2015, the California State legislature passed a bill that would require that 50% of its electricity be from renewable sources by 2030. The changes in the power generation fleet would underpin the impact of electrifying a number of energy applications that currently directly use fossil fuels, such as vehicles, boilers and furnaces. Under the deep de-carbonization scenario, 90% of final energy use in residential and commercial buildings would come from electricity, compared to about 50% today, the report stressed. 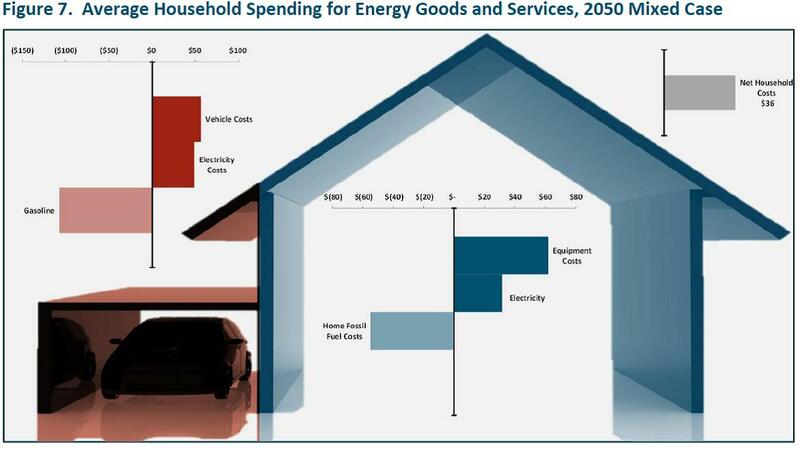 Under the deep de-carbonization scenario contemplated, household spending on energy in 2050 would be about $35 per month more relative to the reference case, This uptick includes a roughly 14% increase in retail electric rates by 2050. This small net increase in costs mirrors that for the country as a whole, being the result of increased spending on energy efficient and low-carbon equipment such as alternative vehicles, heat pumps, and LED lights, minus savings from reduced purchases of gasoline, diesel, natural gas, and fuel oil enabled by this equipment. There are multiple alternative pathways to achieving the 2050 emissions-reduction target using only existing commercial or near-commercial technologies, at a net cost equivalent to about 1% of GDP. 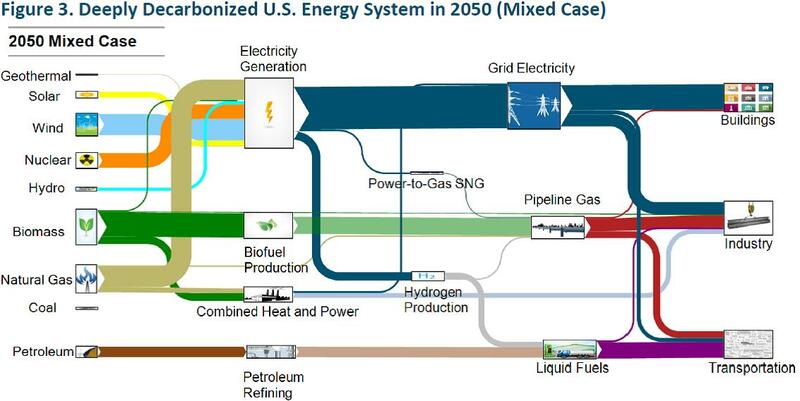 The analysis builds on results from an earlier report, Pathways to Deep Decarbonization in the United States (DDPP, 2014), conducted by Energy and Environmental Economics (E3) in collaboration with Lawrence Berkeley National Laboratory (LBNL) and Pacific Northwest National Laboratory (PNNL) for the Deep Decarbonization Pathways Project (DDPP), an international consortium of research teams studying pathways to deep decarbonization in sixteen of the world’s highest-emitting countries. The DDPP is led by the Sustainable Development Solutions Network (SDSN) and the Institute for Sustainable Development and International Relations (IDDRI). On the cover of this study it shows IDDRI’s and SDSN’s logo’s together; and under SDSN’s logo, it states: “A GLOBAL INITIATIVE FOR THE UNITED NATIONS.” So there you have it; the U.S. Department of Energy and its National Labs are reporting to the UN? Yes, I know how it sounds. But I also know that a thin line often separates paranoia from an acute appreciation of reality. A similar example may be taken from this year’s “CERAWeek,” which just ended. 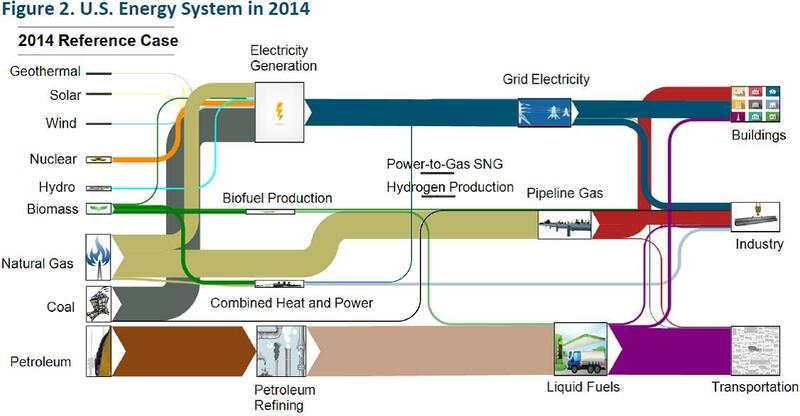 This event has been deemed to be “the Davos of Energy.” Yet despite the fact that natural gas delivers more BTU’s to consumers (in America at least), no gas utility representatives were on the agenda. One CERAWeek” panel reportedly tried to address concerns that there may a growing lack of fuel diversity (i.e., too much “clean energy” investment in natural gas and renewables); but only in the context of electric generation. Apparently, natural gas used to power electric power plants is deemed clean; while natural gas used directly by end-use consumers isn’t. As the saying goes, “If you’re not at the table, you’re probably on the menu;” and not only in California. Both “CERAWeek,” and the “Policy Implications of Deep Decarbonization in the United States” indicate that the direct use of natural gas appears to be firmly in the category of menu item. These events may further indicate than an energy equivalent of “ethnic cleansing” is at least being contemplated on a national level for natural gas direct use. Considering how this is already happening with coal, it should come as no surprise that natural gas direct use is also being targeted. Mark Krebs, an engineer by training, has been involved with energy efficiency design and program evaluation for more than thirty years. He has served as an expert witness in dozens of energy-efficiency filings, which he summarized in a Public Utilities Fortnightly article, “It’s a War Out There: A Gas Man Questions Electric Efficiency” (December 1996). Once you assume that electricity emerges from the end use power panel at 100% efficiency, the path ahead becomes obvious. This assumption is as defensible as the assumptions regarding CAGW which drive “deep decarbonization”. Sadly I have to report that New York is headed down the same path as California with the same 50% of electric generation from renewables by 2030 goal. New York more than California depends on natural gas for space heating and I would argue that the direct costs to convert residential heating from natural gas to electric are underestimated (you have to have a ground based heat pump here for example) and the unintended indirect costs have not been considered (I bet this would shift the annual peak load to winter and that has implications for using solar). (https://www.gpo.gov/fdsys/pkg/FR-2016-02-16/pdf/2016-03118.pdf) Basically, what you said appears to be precisely what DOE intends to do. Feel free to use line. DOE has attempted to take that position previously, in the case of DG. NY and CA won’t be alone for long if Obama and his cohorts have their way. As for “unintended consequences,” I think electricity monopolizing energy is clearly intended. IF you believe wind and solar are the clear LCOE winners and the electric industry won’t engage in monopolistic pricing, it will all work out for the greater good. The path to reducing emissions and spurring economic growth has always been innovation. President Obama’s Clean Power Plan and adoption of the Paris Climate Agreement embraced this principle. Solar energy has reached cost parity with coal and gas in many regions of the country. It is projected to be cheaper than fossil fuels in most places by 2017. The same study was used in Missouri’s latest state energy plan.